The National Integrated Early Childhood Development Policy (NIECDP) (2015) is an important step in South Africa’s shift from a health system focused on curative, disease-based services to one based on prevention and health promotion. The NIECDP identifies a comprehensive vision of early childhood development (ECD) services to be delivered by 2030, seeking to strengthen and integrate these services across all government departments. While recognizing the Department of Health’s Community Health Workers (CHWs) present role in providing supportive health and nutrition services, the NIECDP envisages these CHWs playing a significant, and expanded, role in strengthening overall maternal and child developmental outcomes by providing parenting support and opportunities for early learning and stimulation through additional home visits and community-based activities for families and young children through the age of two, commonly defined as part of first 1000 days services. The evolving role of the CHW in ECD services is set against the backdrop of continued Primary Health Care Re-engineering efforts. This study is intended to provide insight into how the Department of Health is endeavoring to implement the NIECDP, with particular focus on the role of CHW. 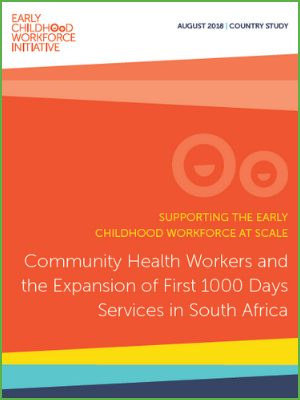 It examines the experience of two provinces and aims to consider the implications for service delivery across the country, as well as provide recommendations to enable, prepare and support the CHW workforce to deliver on this expanded suite of early childhood services. Given that many countries are considering expanded roles of para-professionals such as CHWs, it is also hoped that this study will contribute further to the knowledge base around delivering integrated health and development services for young children across a range of contexts. What is the status of implementation of the first 1000 days services in the NIECDP by the Department of Health? What are the barriers and opportunities for the Community Health Worker to deliver the first 1000 days services outlined in the NIECDP? What lessons can be drawn from their experience?